Going Alpine in the Garden with Deco-Pak in this hot summer! There is this myth that planting and growing alpine plants is very difficult but here at Deco-Pak, we would like to put a stop to this talk all together! Choose a place where the plants can receive the most sun possible throughout the day and remember it is always better for the plants to spend a few hours in full sun than remain shaded all day. If you want to introduce some shade loving varieties, these can be planted in shady areas provided by the rocks in your display. It is essential that alpine plants have great water drainage so choose a spot on a slope or artificially create one. Alternately you can use a raised bed. It is recommended to draw out a plan of what you want your garden to look like before you actually start so you can bear in mind any factors that will interfere with the health of your plants. When planting, remember to allow for a plants height and spread as giving them enough room to grow is crucial. One part Chelsea Multi-purpose compost or Ericaceous compost for lime-hating plants. Remember to adjust these for individual plant requirements! Top-dressing the plants with a layer of gravel will help reduce evaporation and deter slugs and snails, this is essential for both Rock gardens and potted displays such as sink gardens. Placing decorative grit around plants reduces evaporation and also deters slugs and snails from feasting. To avoid rotting, ensure that there is plenty of drainage and integrate Chelsea Garden Horticultural Grit into the soil. 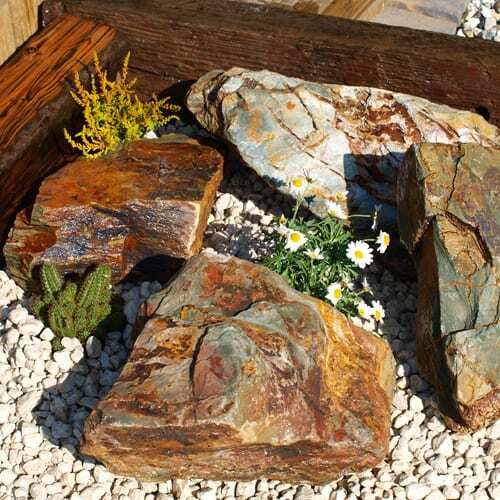 Choosing a range of rock sizes will keep your alpine garden looking as authentic as possible. Starting with a keystone (larger rock) and then placing the smaller rocks around it will help keep the authenticity.